Join us for an exciting CPD event with a difference! 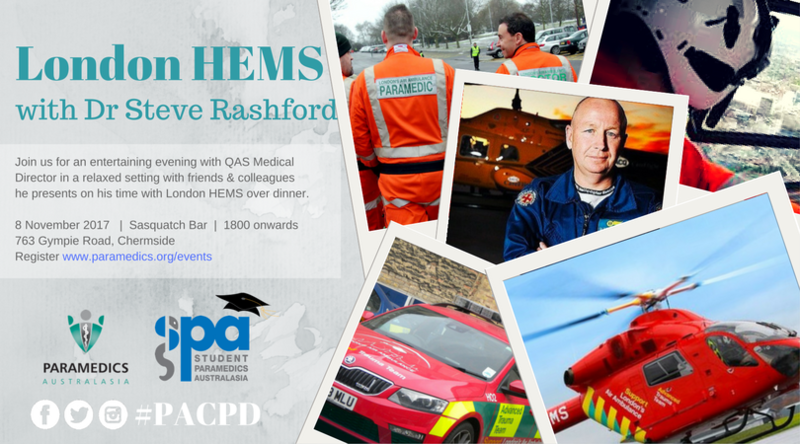 QAS Medical Director Dr Steve Rashford will be presenting on his experience over in London working on the London Air Ambulance, over a light dinner & drinks with friends & colleagues. Dr Rashford presented this presentation on the Gold Coast at the SPA #GCTrauma event & it was so good we have asked him back. Costs cover catering & venue. Please choose what you'd like to eat from the Heroes menu below & email jamie.rhodes@ambulance.qld.gov.au so that he can advise the venue ahead of time. We will cover an array of sides to share amongst everyone.